The Tampia gold project has been acquired via the takeover of Explaurum Limited (ASX:EXU) by Ramelius in late 2018 / early 2019. The takeover offer closed on 22 February 2019 with Ramelius acquiring over 95% of Explaurum shares and is now progressing to a compulsory acquisition and de-listing. 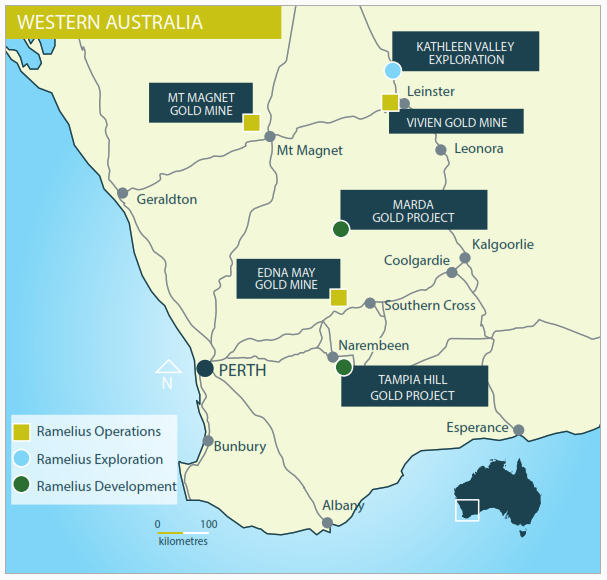 The project is an undeveloped gold project located 12km south-east of the town of Narembeen in the Western Australia wheatbelt and 250km east of Perth. The deposit is 148km by sealed roads from the Edna May gold mine. The deposit is located on granted mining lease M70/816. The total project area covers 327km², comprising two mining leases and nine exploration licences. The deposit is hosted within a highly metamorphosed mafic gneiss unit. The mafic gneiss contains migmatitic feldspar-biotite-quartz banding within an overall synformal structural trend. It is also intruded by granitoid dykes and sills. Mineralisation occurs as shallow dipping stacked tabular lodes within the mafic gneiss. These lodes are approximately parallel to the overall mafic gneiss unit geometry, banding and synformal structure. Granitic sills are intruded sub-parallel to lodes and are late and unmineralised. Gold mineralisation is associated with hornblende-biotite-pyroxene-plagioclase alteration and disseminated arsenopyrite-pyrrhotite-chalcopyrite sulphides. Gold mineralisation correlates strongly with Arsenic grade and fresh ore is partially refractory. Weathering is relatively shallow. Mineralisation currently extends over a strike length of 700m. The tabular lodes are between 2 and 20m thick with a drilled down-dip extent of around 350m. Between 1 and 3 economic lodes generally occur per drill section. Explaurum Ltd completed a significant 40m x 40m spaced resource drilling programme in 2017 and generated a Feasibility Study in May 2018. *Refer to EXU ASX release ‘Tampia Feasibility Confirms Robust High-Margin Gold Project’, 30 May 2018 for full details. The deposit is augmented by the small Mace paleochannel deposit. The deposit hosts re-mobilised, frequently nuggetty gold, in a 10 to 50m wide, 2 to 6m thick paleochannel zone occurring 10-15m below surface. The channel starts over the main Tampia deposit and extends north-west for 550m. Gold is hosted by clays and the base of the channel marked by semi-rounded quartz fragments. While not large, the Mace deposit represents a low-strip, free milling, high-margin ore source. 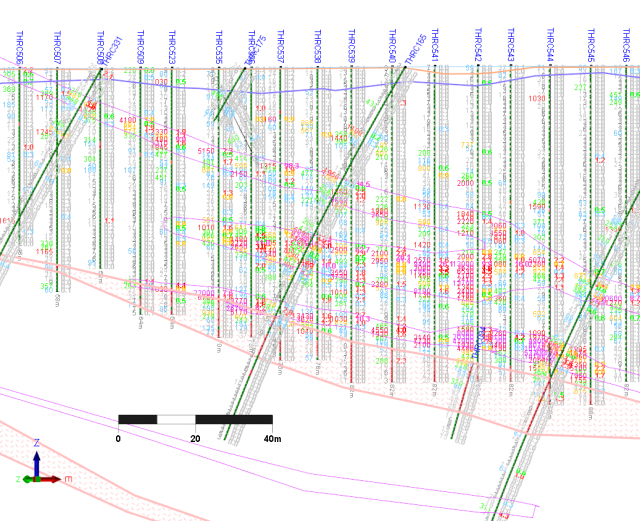 Since completion of the last resource, Explaurum drilled a further 133 close-spaced ‘grade control’ RC holes at the core of the deposit. In early 2019 Ramelius has conducted targeted 20m infill resource drilling at Tampia and will generate a revised Resource estimate. Additional studies for hydrogeology, metallurgy, haulage and processing are progressing. Evaluation of onsite milling and ore haulage options to Edna May will be undertaken as part of a Strategic Review and the final project mining and milling strategy completed by mid-2019 with the associated statutory approvals process to progress in later 2019.